Catch up on all the latest in the world of Document Management and ECM but visiting our blogs. Implementing an enterprise content management system, or ECM, is an incredibly beneficial business choice. To ensure that the implementation of this system goes smoothly however, you must ensure that you follow the necessary steps for success. In a competitive market, your success is dependent on how your business handles internal organization and processes, while still focusing on their job. This can be difficult, and you may be wondering if the systems you have in place are working in your favor. Did you know that the average employee can spend up to 40% of their time at work simply searching for work related information? That’s 16 hours a week! Implementing a new document management system requires careful planning to prevent a colossal waste of time, money and effort. Learn how to set the groundwork for a successful implementation of proper document management. Choosing to implement an ECM system, or enterprise content management system, is an incredibly beneficial choice that will make a lasting impact on your business. But, without proper planning and smooth execution, you can greatly increase the potential for failure or missing out on the benefits you want. Are you still relying on paper? If your company is still relying on paper-based processes for day-to-day tasks like invoicing and recruiting, you might actually be preventing your business from achieving its full potential. Becoming a paperless office is an impactful business choice that will optimize and simplify nearly all of your processes and tasks. With the advancements in technology, it’s never been easier to make the change to digital documents. The benefits of a paperless office are numerous, and you will notice them immediately. Is Imaging Right For You? If you’re exploring the option of integrating document imaging into your records management plan but you’re not sure if it’s the right fit for you or how quickly you’ll see a return, then this eBook is for you! A typical employee can spend 30-40% of their time looking for information locked in email, documents, shared servers and even filing cabinets. Find out how to stop looking and start being more productive! Human resources departments are continuously faced with the ongoing pressure to do more with less, including becoming more efficient with the handling of HR records and employee transactions. Learn how to save your HR department time and money with our new eBook! A lot of people can be intimidated by cloud computing – but trust us, there is nothing to be afraid of. In our new eBook, we’ll share with you the many perks of how embracing the cloud can benefit your business. Is your digital document management system working for your business? What if there is another system out there that could be working more harmoniously with your business needs? 7 simple, easy, document management tips for mid-size businesses that you can start today! Many mid-sized businesses are working with inefficient document management processes that make it difficult to solve problems and respond to questions from suppliers, customers and colleagues. If any of this sounds familiar, this eBook is for you! Curious about how digitizing processes and eliminating paper can deliver value for your business? Then this eBook is for you. In your best-case scenario, you’re researching enterprise content management because you want to provide better service to your customers. In your worst-case scenario, you’ve experienced a compliance issue that has cost you money – maybe even damaged your reputation. Either way, the day to finally consider ECM has finally arrived and this eBook will help you on that journey. Organizations around the world feel the pressure to accomplish more and more with fewer resources. For many employees, it’s a struggle to stay on top of daily workflows because they’re inundated with information and hampered by inefficient, paper-based business processes. Revolutionize your business processes with our new eBook. Introducing a document management strategy in your office is an incredibly beneficial business choice, but it can come with a sense of hesitation from employees. Find out the best ways to introduce document management with our new eBook! For a technical, data-driven field, accountants at many companies spend surprisingly large amounts of time on manual tasks, time that is better spent to further the company’s enterprise performance management. If you’re ready to streamline your accounting processes this eBook is for you! Curious about how digitizing processes and eliminating paper can deliver value and impact your top and bottomlines? Then this eBook is exactly what you need! Learn how Orillia Soldiers’ Memorial Hospital improved record security and sped up their access to critical patient information. Learn how Zive Financial digitized 45,000 documents for a paperless, stress-free office that they could maintain going forward. Learn how the Amalgamated Transit Union Local 1572 saved thousands annually in labour costs and made their employees more responsive to their members. Learn how Airport Development Corporation made their documents globally available 24/7. Learn how Apollo Health and Beauty Care reduced printing costs by over $12,000 a year in their finance department and streamlined their product development. Learn how the Girl Guides of Canada Ontario Council went digital to preserve their past. We’ve designed this webinar to shine some light on workflow charting and get your company streamlining information faster then ever, saving you from stress and time loss. Going paperless can be a challenge, but the benefits of doing so cannot be overlooked. So, where do you start? The answer is with our free webinar – Planning For Document Management Success. Check out our webinar to learn how companies strengthen security and support compliance with document management. Don’t miss our webinar to see how you can easily carry out your custom document retention policy in a modern document management solution. Find out how five crucial business needs are met with cloud based document management and get a peak into the world of mobile document management. Who prepares our files for scanning? As we always say, we provide Peace of Mind, Not Pieces of Paper; meaning we can handle every aspect of the scanning project for you including transportation, document preparation, scanning, indexing and quality control. We’ll make every effort to make your scanning project as low-impact as possible. However, if you have the staff and resources available and are looking to work within a budget, our staff can certainly review preparation best practices with your team so you can prepare the files before scanning. Our documents are confidential, how do you address security concerns? We employ a highly comprehensive security policy to protect client information. Whether you have accounting files, medical records, member files or financial information, we treat your documents with the highest level of concern and protection. Our complete security overview is available upon request. Simply contact us today to request a copy. Is the scanning done at your facility or ours? Typically, the scanning is performed at our secure conversion facility for maximum efficiency, turnaround time and cost savings. Typical concerns clients have about offsite scanning are security and access to their files. To address the access to information concern, we offer emergency file retrievals while your documents are at our facility for scanning. When you make a request for a file, our production team will move it to the front of the queue for scanning, once scanned we can transmit the document to you via secure, encrypted file transfer protocol. However, despite all our security procedures, we do understand in certain applications documents are not allowed to leave your facility and onsite scanning can be performed in these scenarios. How do you ensure every document is captured? We take great strides to verify the accuracy and integrity of our scanned documents. The first option, which is included in all our scanning projects, is the use of state of the art document scanners with industry leading double feed detection. Our scanners use triple ultrasonic double feed detection which detects minute air pockets between multiple sheets being fed through the scanner, virtually eliminating double feeds. In addition, we also offer services for document imprinting which stamp every page as it exits the scanner indicating it has been scanned, and for highly sensitive application we can even perform image to paper verification. Can you provide me with a price over the phone/email? While we can usually provide a preliminary estimate over the phone, our most competitive and firm pricing comes from meeting with you, understanding your needs and surveying your documents. More often than not, when we have a chance to look at the documents prior to quoting we can discover and recommend cost savings initiatives and functionality improvements. 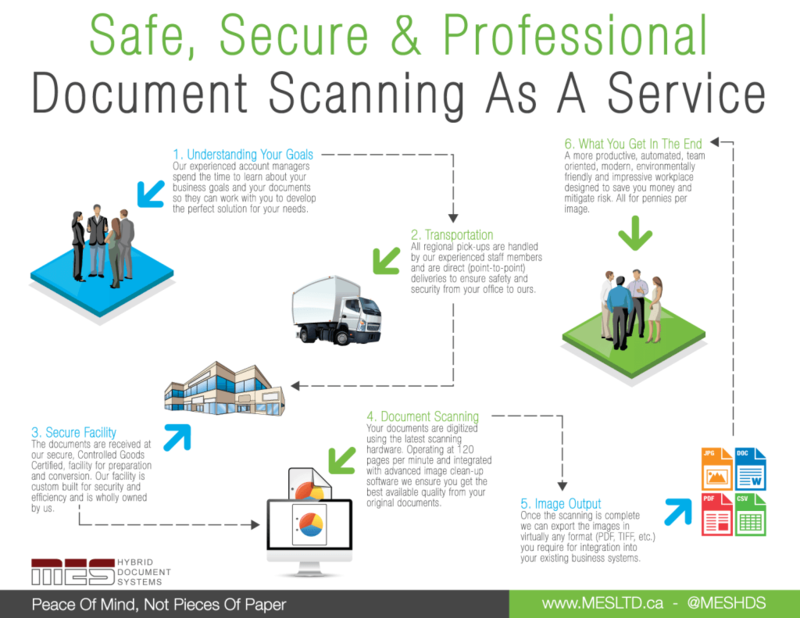 Simply contact us today to schedule your free document scanning assessment. We’re a small company, how can we afford a document management system? We’re happy to bring our clients, large and small, a full range of document management products. Whether you’re looking for a small office solution or a robust enterprise automation solution, we can tailor a system to your needs and budget. Can I import my existing files seamlessly into your document management system? The answer to this question will vary from application to application. There is almost always a method to ingest existing electronic records into a new document management system. Depending on the consistency of your existing indexing system and the types of documents, we can usually automate the indexing process as well. For more details or for a specific review of your application, please contact one of our solution experts today. What’s the difference between Cloud and On-Premise document management systems? Cloud (a.k.a. Software as a Service, ASP, On-Demand) is a software solution that is hosted in secure data centre as opposed to your internal network (On-Premise). Typically both options offer the same level of functionality and user interaction. What solution is right for me? Cloud or On-Premise? Cloud solutions are ideal for organizations that don’t have depth in their IT department, require back-up redundancy beyond their internal capacity and/or don’t wish to make the capital investment for on-premise software. On-Premise software is ideal for organizations who wish to keep all their content internally on their networks. Cloud solutions are typically priced based on the amount of storage space used (GB per month) and allow organizations to grow their system without purchasing new hardware. On-premise solutions typically involve a one-time upfront investment for the software licenses, installation and training, and an optional ongoing fee for software maintenance and support. Can the software be customized to our needs? Certainly. We recognize that there is no “one size fits all” solution when it comes to document management software. Our systems can be tailored to your specific needs, often with little or no special coding. Things like index fields, document types, document requirements, workflows, external business system integration and more can be configured to your ways of working. Can your software integrate with our existing systems? Our software solutions have the options of application linking, database connections and embedding with many standard office and business systems to allow more accurate data validation, faster lookups and improved productivity. It is important to note, however, that some business systems are proprietary or protected and do not allow external connections. Process management, sometimes referred to as workflow, is the routing of electronic images and content through pre-defined and ad-hoc business rules. Examples of process management workflows could include AP invoice payment, employee onboarding, expense requests, new client setups, sample requests and more. How do I pick the right scanner for my application? Picking the right scanner is an important part of any document scanning application. You want to plan for future growth and influxes during peak business without buying more machines then you need. Our team of solution experts are here to help, contact us today and we’ll be sure help you select the right scanner for your application. Image enhancement software is a tool built into most Fujitsu and Canon document scanners. The software automatically examines documents and applies the correct colour/brightness/contrast settings to dynamically deliver high quality scanned images without the need to adjust every image manually. Using image enhancement software is like having a quality control operator working to clean all of your toughest documents and reveal your data. Do you have a showroom where I can see the scanners? Although we do have quite a few scanners available for demonstration, with the every changing product line it’s difficult to maintain a showroom with all the latest scanner models. However, through our partnership with Fujitsu Canada we can supply our clients with a two week, no obligation, trial of any Fujitsu scanner. This gives you the opportunity to try the scanner in your own environment prior to making the investment. Contact us today for more information and/or to arrange a trial. I have very delicate documents, how will they go through the scanner? High speed doesn’t have to come at the cost of damage to your documents. The scanners offered by MES use a smooth feeding system ensure your documents move at a constant rate of speed throughout the scanner. There is minimal “pulling” on the paper as the feed rollers are timed to gently guide the documents through the feeding path. Despite the advanced feeding systems on today’s scanners, some documents are just too fragile for high speed scanners these are typically very old documents (think early 1900’s). In these cases we would recommend scanners with a straight through feeding path as opposed to a sharp U-bend or a flatbed scanner. Do people still use microfilm? Despite the outdated reputation many people associate with microfilm, it is still a highly used and highly relied upon archival media in many organizations. However, the role of microfilm has definitely switched from a primary media for records management to more of an archival security policy alongside working digital records. This is because no other media offers the long-term archival preservation found with microfilm. If processed and stored properly, most silver microfilms will have a life expectancy between 100-500 years and has been in practical use since 1928. Microfilm is an analogue media that isn’t reliant on specialized technology to access the information. So for applications like student records, HR files, pension records, medical charts and other long term retention applications, microfilm is still a viable back up media. Can you scan my old microfilm records to digital images? Our microfilm conversion department has the equipment and know-how to scan rollfilm, microfiche and aperture cards to use for digital images to improve collaboration and information access. Whether you have a few rolls or a few hundred thousand microfiche, we can help. Our microfilm scanning department scans over 20 million images each month from microfilm to digital images. Simply contact us today For more information and complete details. Could I buy the equipment to convert my microfilm collection ourselves? While we do sell high volume microfilm scanning equipment, it usually isn’t a cost justifiable solution to convert entire collections internally. Production level microfilm scanners range from $70,000 to $100,000+ and typically are only able to convert one format of film per machine (e.g. rollfilm, aperture cards or microfiche). So depending on the size and make up of your collection you may require several machines to perform the conversion. I don’t need to convert my entire collection, just selected images as we need them. Do you sell machines for that? Certainly! We offer a collection of on-demand microfilm scanners from industry leading manufacturers. These machines can connect directly to your computer and provide you with the ability to search, scan, save, print and share images as you need them from your microfilm collection; they’re great for walk-up users and back office applications. Simply contact us today for pricing and to schedule your free demo. I have very old documents; will they get damaged in the process? At MES we take every precaution to protect your historical files. Our microfilming equipment doesn’t require paper to be fed through high speed machines with tight U-bends; instead with use planetary microfilmers to capture images with an overhead camera. Is there a way to back up electronic records to microfilm for preservation? Our production department is equipped with two Kodak Archive Writers which have the ability to take electronic images and convert them directly to archival microfilm without the need for paper. This process, called Archive Writing, helps organizations preserve sensitive electronic data in a secure, unalterable, analogue format. What types of machines do you service? Our factory trained service technicians can help maintain a wide variety of document scanners including Fujitsu and Canon models. Additionally, we can service virtually any piece of microfilm equipment from vendors such as Canon, Kodak, Alos, ST Imaging, Indus and more. If you have a specific model or piece of equipment in mind, contact us today for competitive rates and professional level equipment service. Our technicians are here to help from 8:30am to 5:00pm, Monday through Friday. In business critical situations we can even provide overtime and after hours support. We’re pleased to offer three different tiers of hardware support; on-demand, standard protection plans and business critical protection plans. On-demand plans are billed on a time and materials basis and calls are scheduled on a first come first serve basis. With standard protection plans our goal is to be onsite within 8 business hours and best of all your parts and labour costs are covered in one yearly maintenance contract. Business critical protection plans are for clients with business critical applications. With these plans our goal is to be onsite within 4 business hours to minimize downtime and keep you running at peak performance. How long will it take to fix my equipment? When you call us for service, our dispatchers will take down all your equipment information and the trouble reported. This information is then passed along to your service technicians who have access to our stock of over $300,000 in commonly used parts. Based on our decades of experience, we’ll bring the parts we believe will be needed to get you up and running on the first call. What is covered under my annual protection plan? Protection plan coverage can vary slightly based on the client’s specific needs and type of equipment. In general, our annual protection plans cover onsite labour, remote troubleshooting and service parts. Annual protection plans do not include glass items, consumable items such as toner or operator replaceable parts such as light bulbs.